Hi guys! Is it just me or is this week crazy already? Work has been over-the-top busy for some reason and I can't wait for things to settle down (I don't know when that's going to happen though). Oh the bright side, my family is going to come visit this weekend, and the weather should cooperate. Tonight I have the second set of discontinued KBShimmer polishes, so let's get to it. Is anyone surprised that I was a band geek in high school? My school was small, but band was really large (we had from 250-300 people). 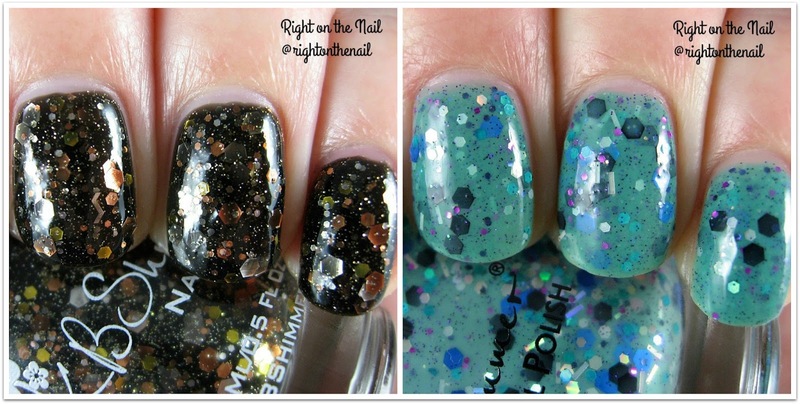 KBShimmer's Band Geek is a black jelly polish with gold, copper, and silver hexagonal glitter in different sizes. Jelly polishes are notoriously sheer, so it is no surprise that 3 coats were needed here. Make sure to use thin coats and dab the glitter on in the last coat. You may also need to double up on the topcoat because it tends to remain bumpy. I'm one of the few people who like bar glitter, so Proud Peacock was right up my alley. The bars seen here are not the stringy ones, but stubby and thick ones. Proud Peacock is a teal crelly with black, blue, fuchsia, and silver glitter. I love everything about this polish! It only needed 2 easy coats for full coverage, but you may need to double up on topcoat on this one as well. You can buy most KBShimmer polishes for $9.25 and their Spring 2016 collection will be released on March 15th. I'm not sure if I'll be able to resist some of the Mega Flame Collection. Make sure to check them out on their website, Facebook, Twitter, and Instagram for more information. Pretty swatches indeed! Who would not want to try them out. Love the colors and chunks of glitters in it. Thanks for the comment, Jessica! As you can tell, I'm a big KBShimmer fan.